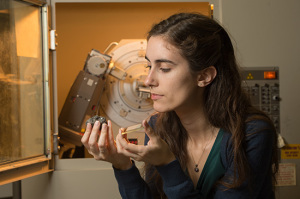 PULLMAN, Wash. – A Washington State University undergraduate has helped develop a new method for detecting water on Mars. Her findings appear in Nature Communications, one of the most influential general science journals. She is the lead author of the article in Nature Communications. Among multidisciplinary science journals, it has the third-highest impact factor, a measure of its influence, after the journals Nature and Science, according to the 2013 Journal Citation Reports. “I was really crazy about it—really intrigued by the buzzword ‘Mars,’” she said. “I think this quantification of volcanic textures is a new facet of the water story that hasn’t yet been explored,” Wall said. “Most of the studies searching for water have focused on either looking for sedimentary structures—large- and small-scale—for evidence of water, or looking for rocks like limestones that actually would have formed in a water-rich environment. The project was funded by the WSU College of Arts and Sciences’ Grants for Undergraduate Scholars and by the NASA Space Grant Undergraduate Scholarship in Science and Engineering.